Welcome to the Precision Systems Design Laboratory (PSDL) in Mechanical Engineering at the University of Michigan. 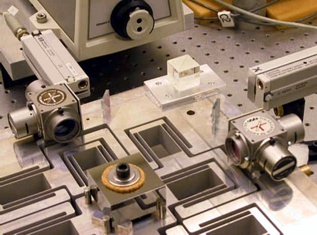 Our research interests lie in creating novel machines, devices, and instruments for applications in healthcare, manufacturing and metrology, automotive and MEMS. Our design philosophy is based on the principles of Precision Engineering and Mechatronics, with an equal emphasis on modeling and hardware development. Via research and innovations, we strive to create new technologies that can be either licensed or commercialized. Our work has led to two early stage technology start-ups: FlexDex Surgical and HIPERNAP. We also work to develop synthesis methods, modeling tools, and design insights for practicing machine designers and engineers. One example is the Beam Constraint Model developed for flexure mechanism design. Ongoing research topics in our group include parallel kinematics, design and analysis of flexure mechanisms, dynamics and controls of flexible systems, and electromagnetic and electrostatic system modeling. Select applications include minimally invasive surgical devices, nanopositioning systems, manufacturing and metrology equipment, electromagnetic actuators, MEMS actuators and motion stages, and gasoline direct injection (GDI) systems. Please feel free to browse through our research pages - your comments and feedback are welcome. If you are interested in joining our group, please click here for further information. © Precision Systems Design Laboratory 2014. All Rights Reserved.